Hannah Senesh Community Day School Endowment: Growth Includes Planning. UJA-Federation of New York, the Avi Chai Foundation, the Jim Joseph Foundation, and a select group of individuals, created the Day School Challenge Fund because they know that the future of Jewish day schools depends on thoughtful planning and financial sustainability. 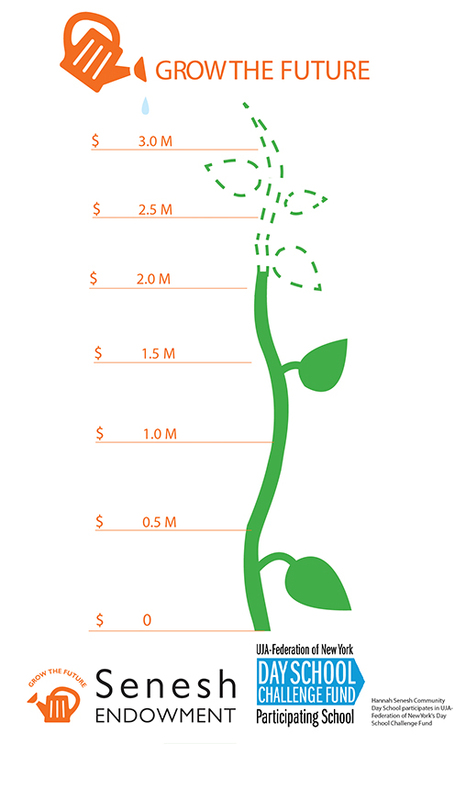 Through the gifts of many generous donors, we have raised more than $2 million to seed the Senesh DSCF Endowment. We have until December 2018 to bring in Endowment pledges of $25,000 or more for a 1:2 match on annual distributions by UJA-Federation’s Day School Challenge Fund. If you are interested in having your investment in the future of Jewish education matched through an enduring gift to the Senesh Endowment, please give now. In addition, all Legacy gifts earmarked to our Endowment from donors 70 years and older will be matched 1:3. Please make your pledge to the Senesh Endowment today, so that we may help ensure the continuity of Jewish life and Jewish leaders for years to come. For more information about the Senesh Endowment, contact Director of Development Karen Stein at 718-858-8663 x318 or kstein@hannahsenesh.org.